How can businesses benefit from one of the greatest tools in marketing over the last decade if they do not know how to track it? As a social media management firm, your job is to help companies understand their ROI. To help you out, here’s a guide for educating your clients on social media management ROI strategies. To do this, you need to ask: why you are on social media? What drove you to use the platform? Are you doing this just because someone told you to? Maybe you did some research and found out it was a good way to get business? Measuring social media can save you from wasting time on the wrong efforts. When you create goals on social media, you need to be able to pivot and determine the best revenue generating strategies. You measure your results to see what changes to make to your approach. Determine if your spending on social media can make returns in terms of time and money. It could be increased sales, reduced customer service costs, and/or additional repeat purchases from your current network. You need to determine the costs of being on the social network. You have to figure this out before you create goals, because your budget will directly affect what you can achieve. Here are a few costs your clients should think about with regards to social media services. Content creation: Are your clients going to create the content or outsource it to a reputed social media company? Community management: The same is true for managing and growing the community. It does not happen magically, but requires the “human effort” Jay Baer mentioned earlier. Ads: With Facebook’s organic reach at only 2.6 percent right now, your campaigns may not get traction without paid boosts. The same goes for Twitter and LinkedIn. Ads could be the largest percentage of your social media campaign budget. Tools: We’ll discuss some of the tools below. Keep in mind that a number of these tool require an investment. However, they can also save you time and money on the management and content creation side. Once you know your costs and have a good understanding of why you are on social media, you can define your goals. These are the measurement sticks your clients will use to measure the success of your campaigns. The biggest challenge for most businesses is that they are not sure what is supposed to be measured on social media. That is part of the reason why they do not measure at all. Define your goals in terms of reach, engagement, and conversion. Reach: How many prospects can you talk to on social media? Engagement: Does your social network comment, like, and share your content? If not, why? If so, what do they like most? Conversion: Finally, how many clients do you receive from social media? Now that you’ve defined your goals, you need to measure them. For example, Pennsylvania green tea maker Steaz generates conversation on Facebook and Twitter about their organic tea. Because of these engaging conversations, they reached a wide audience that produced over 250,000 downloaded coupons. The coupons doubled their sales, and is a perfect example of how an expanded reach and engagement generates conversions. Here are tools to help you track your campaign success. Radian6: One of the leading enterprise level cloud tools to help you track, monitor, and respond to comments and questions live. Radian6 offers over 650 million sites where you can monitor your brand online. 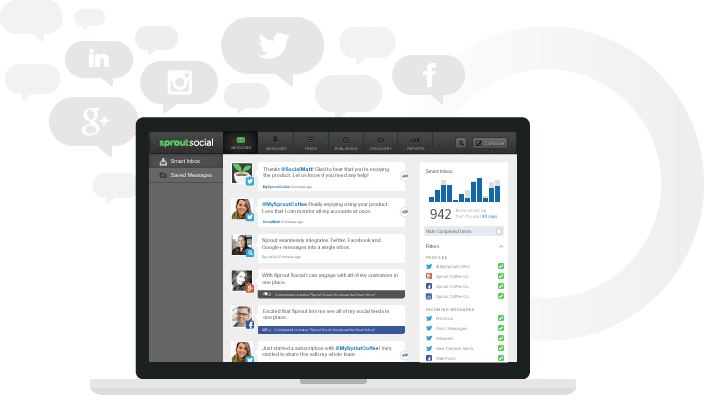 Sprout Social: An agency management tool that helps you schedule, publish, and analyze social media marketing. Sprout Social also has a great social customer service feature for companies who need to respond to clients quickly on Twitter and Facebook. Klout: Tool to help you share great content to your audience, and also evaluate your impact on social media. Influential Klout users gain perks for promoting a product on social media or performing some customer research. The more influence, or Klout, the more perks an influencer receives. Google Analytics: Analyze the traffic to your website, as well as what visitors do once they are on your website. Great way to track conversions from social media. The goals are a great strategy to analyze traffic conversion. SocialMention: Social media analysis and search tool to find out every mention of your brand or competitors over different social networks. HootSuite: Social media management tool to help you schedule and monitor social media content. Enhanced analytics reports to help you evaluate the best content strategy for social media. Facebook Insights: Evaluate the success of your Facebook updates on your fan page, as well as the boosted ads you run. Check on the success of your Facebook page growth. Twitter Analytics: As Twitter says, “measure and boost your impact on Twitter.” You can also explore your followers’ interests, locations, and demographic information. Furthermore, you can analyze advertising information. Buffer: Schedule posts and curate content from across the web on Facebook, Twitter, LinkedIn, Google+, and Pinterest. For every company that complained about not receiving enough sales on social media, you now have a road map to change that predicament. Social media management companies can use this as a definitive method to help their clients improve their social media investment.